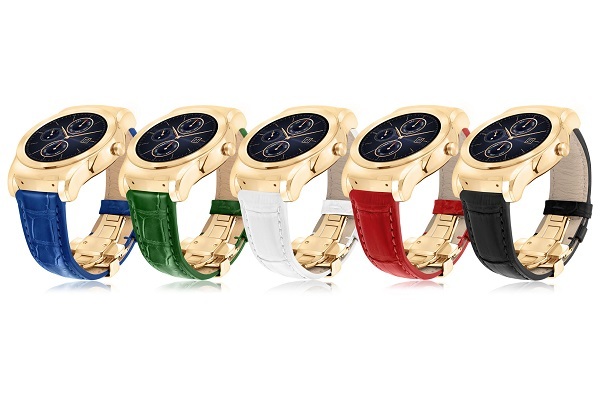 LG announces Watch Urbane Luxe limited edition Android Wear smartwatch with 23-karat gold. In collaboration with U.S. retail jewelry company REEDS Jewelers, LG Electronics will introduce a premium limited edition smartwatch, LG Watch Urbane Luxe. This luxurious wearable was designed with a specific wearer in mind and is adorned in 23-karat gold and gorgeous alligator leather strap set in an exclusive piano-gloss lacquer case. Available starting at the end of October, the LG Watch Urbane Luxe will retail for approximately $1,200 / €1,070. The LG Watch Urbane Luxe will sport a deployment clasp for a fitted, elegant look that isn't bulky. Invented by Louis Cartier in 1910, the use of a deployment clasp makes this timepiece even more exclusive and unique. The alligator band itself is handcrafted at the highest level of craftsmanship, undergoing 50 separate steps in its creation, handled lovingly by 30 experienced leatherworkers. The 23-karat gold used in the LG Watch Urbane Luxe is stronger and harder than the 24-karat gold used in jewelry and heavier than the 18-karat gold used in traditional luxury watches. Operating System - Android Wear - Compatible with Android 4.3 or above. Available starting at the end of October, the LG Watch Urbane Luxe will retail for approximately $1,200 / €1,070. Each of the 500 limited edition watches will be engraved with its own serial number for authenticity and available initially in the USA for pre-order at www.REEDS.com later this month or by visiting any REEDS Jewelers location. Visitors to IFA 2015 can see this beautiful work of art for themselves along with other mobile devices from LG in Hall 18 of Messe Berlin from September 4-9.